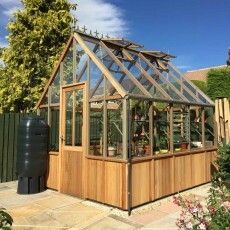 The Cedar Cheltenham Victorian half board model is 8’8″ wide with a generous 5’7″ eaves height and attractive, practical design features. 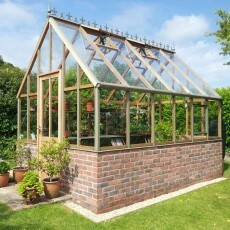 This Victorian style greenhouse is a beautifully designed, robust cedar greenhouse at 8’8″ wide, sitting on a 750mm high dwarf wall. 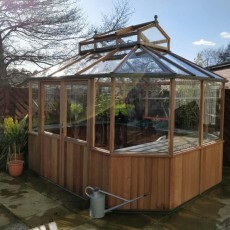 The largest greenhouse in the cedar Victorian range at 10’9″ wide, this model has a cedar half boarded bottom which enhances the beautiful design. 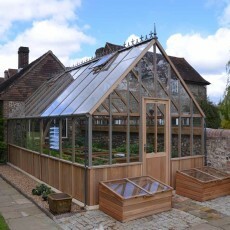 The Oakham is the largest cedar dwarf wall greenhouse available from Alton at 10’9″ wide. 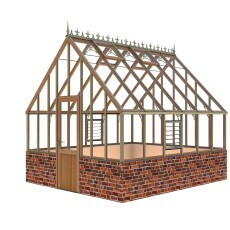 Ideal for the large garden and/or very keen gardener.